Welcome to another Travel Tuesday! If you're new around here, read THIS POST for the why and how around this weekly link-up! I'd love to have you link up this week! Last week I began my mini-series on Bogota, Colombia, which was my first international travel adventure! To start from the beginning, read my Part 1 post from last week! This week I'm going to share more about my mission there with my youth group. This was the group I went with! We went for 10 days and mainly stayed in the city of Bogota. The interesting part of the city though, is that there is little towns in the big city, and our main ministry location was in a small village called Suba. Now, if you saw my photos from last post, Bogota is a pretty busy built up city, yet you find these certain pockets of villages with such great poverty. It was very sad and hard to see. This picture (above) was taken on the roof of the ministry building we went to almost every day. During our time in Bogota, our main mission was to love on the kids that live in Suba and come to the place we ministered at on a daily basis (I cannot, for the life of me, remember the name now! 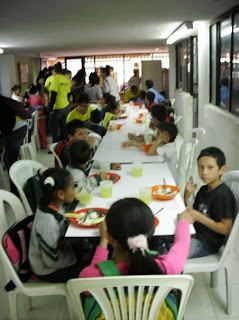 It was basically a church/school building where kids could come and get a meal, learn about God, and learn things you would learn in school). This is where we served and had lunch every day. The reason for this safe haven for the kids is because of several reasons. First, the schools in Colombia are private, and usually cost something for the kids to go to school. The parents cannot afford to send their kids to school every day, because they live on little to no income, and a lot of the kids have parents who are involved in drugs. It is really sad, but I'm glad they can come to a safe place and get an education, a meal, and learn about Jesus! We did a lot of skits and dramas to reach the children in many ways. It was a privilege to lead them to Christ! We spent months together as a team learning about the culture, and dramas, Spanish worship songs, etc. to prepare for our mission. One of my favorite songs we learned in Spanish was Mighty to Save by Hillsong. Of course, we also had so much fun with the kids, playing soccer, teaching them "Stomp", and just loving on them! We even spent a couple of afternoons shampooing lice out of the children's hair. Unfortunately, with their living conditions, the lice most likely reentered their scalp, but it was mostly a labor of love, to show them how much we (and Jesus) love them! We got to help make bread for the meals, which was so fun! Speaking of food, the cooks were AMAZING. We never went hungry, and the food was so delicious! We were very blessed! Well, I think I'm going to stop there for today. Next week my post will be all about the KIDS! They were my favorite part of the trip, and I just loved being able to step outside my comfort zone and bubble and experience a different culture and people! Have you ever been to South America or Colombia?! Where is your favorite place to travel?